Float (Color may come as Black or White) can use vertically or horizontally to fit in many different applications. 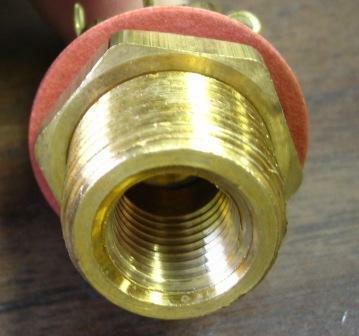 Float measures: 3.5" x 1.25" x 2.5"
Water Input = ¼" NPT Female Threads & ½" NPT Male Threads (If needed, plumbing adapters are available at any local plumbing supply store to connect to any other special threads from your water supply). Requires a ¾" mounting hole & includes washer & brass nut. Float arm has (2) pre-set float adjustment slots or can be flipped over for multible minut adjustments for multi-purpose installations. Drill a ¾" hole in the rear of your skimmer box above the water line. Install the Waterfill Valve with the rubber washer against the inside of the skimmer box so the threads protrude out the back. Attach washer & nut to threaded end and secure against the outer rear wall of the skimmer. 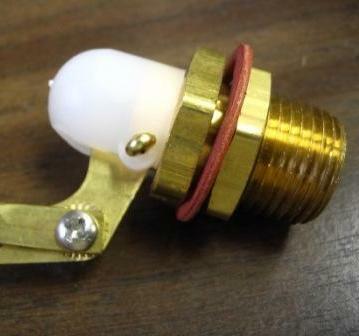 Attach your waterfill hose (adapter may be necessary depending upon type of hose used). Fill your pond's water level to the recommended height. Next, loosen the screw(s) on the float rod where it attaches to the Waterfill Valve. Turn the hose spigot on so water flows from the waterfill valve. Adjust the level of the float so the water just stops flowing. Tighten the screw(s). To view the written Waterfill Valve Instruction Manual (English & French) in a Down-loadable PDF file that can be printed, click on the link. "DOWNLOAD MANUAL"
From Anonymous of Newburgh, Indiana on 10/18/2015 . From Jim of Long Grove, Illinois on 8/7/2015 . From Steve Luko of Mwsa, Arizona on 6/6/2014 . From David Sibel of Acton, Massachusetts on 5/1/2012 . From Anonymous of Parker, Colorado on 5/17/2011 . 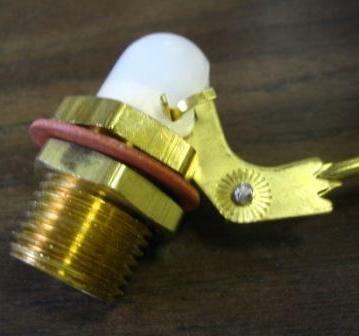 7/18/2012 – why the 1/2" automatic waterfill float valve assembly doesn't fit a regular garden hose? is the pressure from a garden hose . . .